On Monday 21st August the National Office of the WMOF 2018 Launched the One Year programme of preparation at the Marian Shrine of Knock. Fr. Timothy Bartlett Secretary General of the WMOF 2018 and his team hosted a wonderful family fun day of prayer and activities. During the celebrations the image of the World Meeting of Families Icon 2018 was anointed by Archbishop Diarmuid Martin at the 3pm Mass in the Basilica. The Icon was written by the Redemptoristine Community Drumcondra. People travelled the length and breadth of Ireland to mark the one year launch. 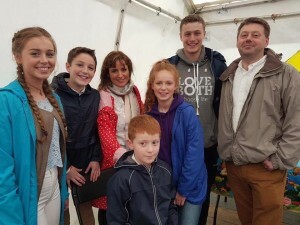 We were delighted that Kielty and Annette Hughes along with their five children travelled from Armagh to represent the Archdiocese of Armagh in the opening procession of the Mass. I would like to invite you all to pray daily the official World Meeting of Families Prayer for your own intentions and for families around the world.